People hunt for many reasons: tradition, way of life, enjoyment and food. We do it for all of the above. We put in the time, energy and money to harvest an animal because we love it, because it is a part of who we are and because it’s a way to provide the healthiest meat possible for our families. But what happens after the tag is punched? What happens after we pull the meat off the side of the mountain? 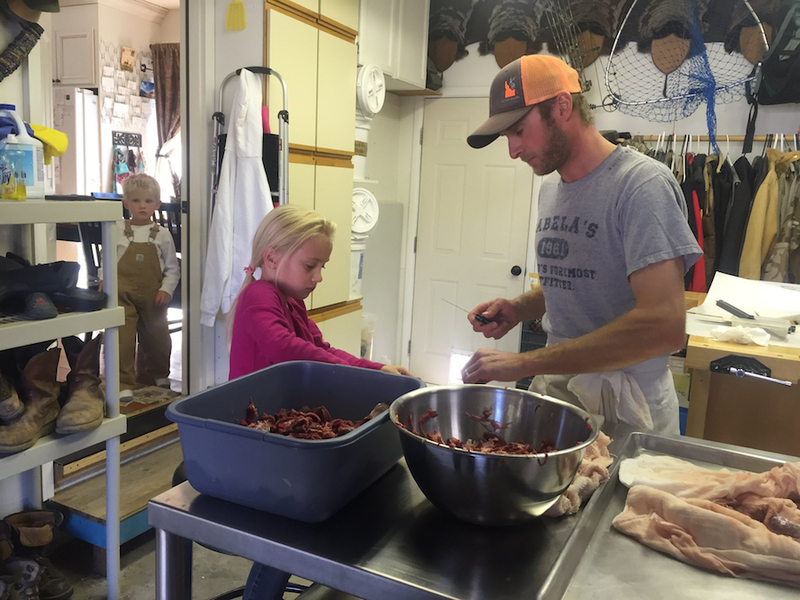 Many make their first stop to the butcher before they head home to unpack from a successful hunt. We challenge that there is another option; a better option. Avid hunters know that hunting is not always the most cost effective way to provide meat. It is definitely a better, healthier source of meat, but cheaper? Most often not. We often joke that we spend $200 a pound for free meat. After tags, time, fuel, gear and all that goes into the hunt each year there must be passion involved to make it worth it, because the numbers add up. In addition to those costs, to outsource the processing one would drop anywhere from $100-300 depending on the animal and processing choices. That adds up quickly if you fill more than one tag. However, to process our own meat is one way to save money. There is an investment up front, but once set up with the basic equipment, it is relatively inexpensive. Although there is an initial investment in equipment, over the long term you will save yourself thousands of dollars on meat processing fees. When choosing to process our own meat we are in complete control of quality. Our own personal standard will be met from beginning to end. Ethically and ideally butcher shops should process one animal at a time, but when it comes time for the grind, most likely yours will be thrown in with many others. This means that all the time and work invested to keep the meat clean, cold and dry is lost, because there is no guarantee of getting back what you took in. For us, it is important that what we put into our meat is the same quality as the game itself. When processing our own animal we are in control of what goes in our meat and what stays out of it. We set the bar. We can ensure the standard of cleanliness. We chose the amount of silver skin that is left or removed and the amount of sinew that goes into our ground. We also control the aging of the animal as well as choosing what parts of the animal we want to use and to what extent. When processing our own game, we are in control of our food source; beginning to end. 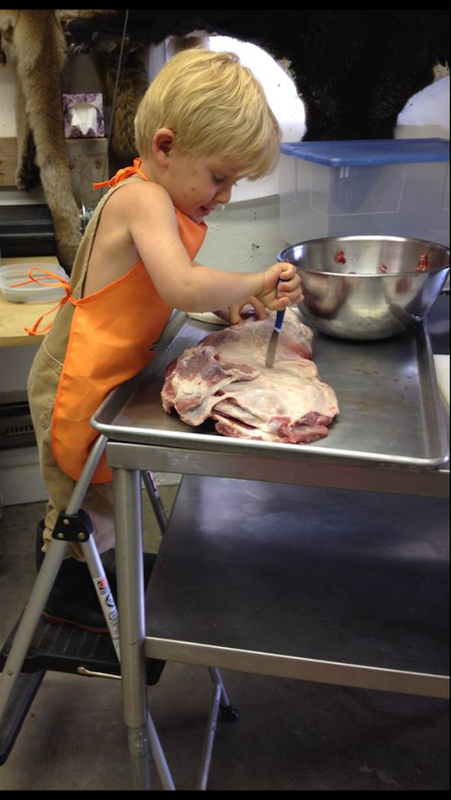 At home it’s clean enough for the author’s son to learn butchering basics. When butchering your own meat, your relationship with the animal you harvested does not end on the side of the mountain. There is a connection and an appreciation for the harvest when you process yourself that is lost when you drop it off whole at a shop. Many hunters pride themselves on the fact that they do so much themselves, from the scouting to the hunt to the pack out. We put our blood, sweat and tears into the animal in the field, making a connection with it that only another hunter can understand. Why stop there? 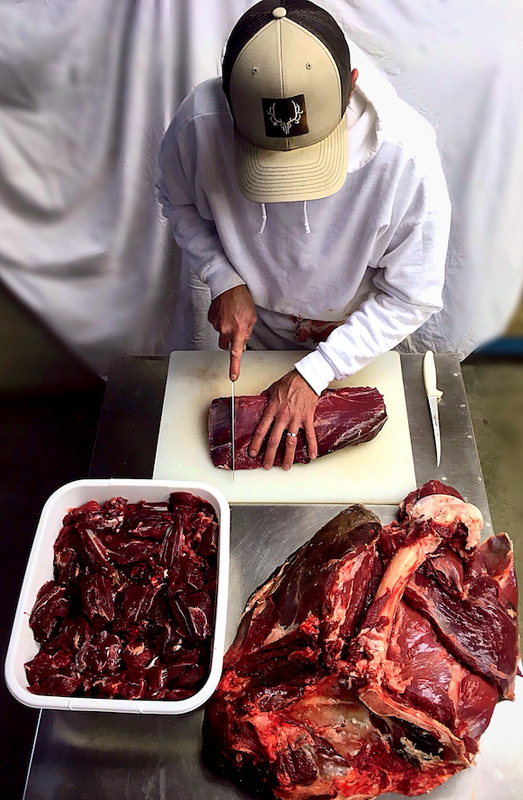 There is such fulfillment and connection when handling our own meat, as it is the completion of the incredible blessing we have to harvest our own food. There is a satisfaction in knowing we did it from beginning to end. This is a skill that is to be learned and passed down. To us, this is as much a part of the process as the harvest itself. It is the culmination of all we work so hard for. 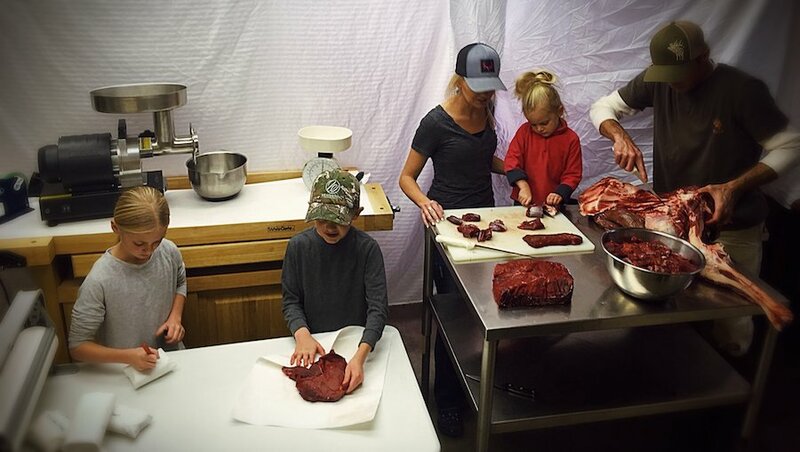 Meat processing at home gives kids an opportunity to learn the skill at an early age. Here the author’s family gets to be a part of the whole process. Yes, the thought of the work ahead when you chose to bring an animal home to process yourself can be overwhelming. It is true that there is something appealing about coming off the mountain cold, wet and tired, dropping your harvest off and going home to shower because the work is done. But we promise you, when you process your own game it is worth it and the reward is great! So, sharpen your knives, it is harvest time!